Hong Kong's Far East Consortium International Ltd (FEC) plans to invest RM150 million to build serviced apartments in Subang, Selangor. The apartment block is expected to be ready in 2014. It is the second phase of development for Sheraton Subang Hotel and Towers, which will be rebranded as the Grand Dorsett Subang Hotel on October 1. The five-star property sits on 6.4ha, out of which only 2.8ha have been developed. Dorsett International Sdn Bhd president Eddie Tang said the investment is in excess of the initial RM500 million allocation provided by FEC to build or buy hotels in Malaysia. Tang said the company had yet to firm up details such as size of the apartment units and whether the units will be sold or leased out by Dorsett. The first phase of renovation and refurbishment, which started recently, involves a sum of RM60 million and is due to be completed in March next year. "Phase 1 involves the rooms, lounge and reception areas, while Phase 2 will include a new lobby for the hotel and additional meeting rooms," Tang said. The hotel currently has 350 rooms. After renovation, it will have an additional 125 rooms, which were not completed under the original owners. The second phase will involve bringing down a hotel block to accommodate the new apartments. This will again reduce the number of rooms to 350. Once the second phase is complete, the entire facade of the hotel is expected to be fresh and different. The hotel was previously owned by the Faber group. FEC bought the hotel for some RM120 million. In an interview with Business Times in July, Tang had said that Dorsett would spend an estimated RM100 million for a 200-room business boutique hotel in Sri Hartamas and RM60 million to RM70 million for a three-star 300-room hotel in Cheras. In Kota Kinabalu, it has identified a location for a five-star 250-room resort hotel that will cost between RM70 million and RM80 million. The group is also eyeing Penang and Kuantan. It hopes to grow its hotel portfolio to 15 by 2014. Apart from the hotel in Subang, it also owns and operates the Dorsett Regency Kuala Lumpur, Grand Dorsett Labuan, Maytower Hotel and Serviced Residences, and the Dorsett Johor. PROPERTY developer Bolton Bhd has appointed a Penang-based construction firm for the main building works of its "Surin by Bolton" luxury condominium development on the island. However, it did not identify the company appointed to carry out the building works, nor indicate the value of the contract. "The contract will involve the structural construction of the twin-towered 28-storey Surin development, atop a five-storey podium car park," Bolton said a statement issued yesterday. The project, which serves as Bolton's maiden property venture into Penang, is slated for completion by early 2012 and is situated on a hill in Tanjung Bungah. Earthworks for the project are 85 per cent completed. "Piling works for the two blocks of condominiums have reached 60 per cent, while construction of the physical buildings begun last month," said Bolton. Construction works on Tower B have started and reached the basement level stage and are slated for completion by 2011. Situated on a freehold 1.36ha site, the Surin development was officially launched in July 2008 and is reported to carry a development value of RM200 million. Bolton executive director Chan Wing Kwong said a take-up rate of 80 per cent has been charted for Tower B, which has 198 units. "All six penthouse units in Tower B have been sold and Bolton has released the remaining 12 penthouse units in Tower A for sale," he added. Apart from local purchasers, Chan said foreign interest has also been expressed for the Surin and there has been purchases made by investors from Singapore and Hong Kong. PETALING JAYA: MK Land Holdings Bhd is targeting to achieve RM52mil in revenue from its hotels and resorts division for the year ending June 30 (FY10). MK Land Hotels & Resorts senior general manager Annuar Yang Ghazali said that as the division was achieving growth even during the current economic crisis, he believed once the economy improved, the division would chart higher sales. “Our hotels and resorts located in Langkawi and Perak have so far been receiving good response from tourists especially from the Middle East, Asean and Asia,” he said. For example, about 80% of the guests at the group’s Langkawi Lagoon Resort comprised foreign tourists, mainly from the Middle East, he said. 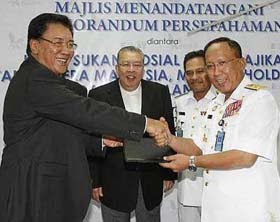 Annuar Yang Ghazali (left) shaking hands with Yang Dipertua of Kelab Sukan, Sosial dan Kebajikan Angkatan Tentera Malaysia and Royal Malaysian Navy chief Admiral Tan Sri Abdul Aziz Jaafar, with MK Land and Kumpulan Emkay chairman Tan Sri Mustapha Kamal Abu Bakar (second from left) looking on at the MOU signing on Monday. Annuar was speaking yesterday after the memorandum of understanding (MOU) signing between MK Land and Emkay Group with Kelab Sukan, Social dan Kebajikan Angkatan Tentera Malaysia (KSSKA). Under the MOU, KSSKA members would be given special rates to visit, stay and enjoy the facilities at the resorts and hotels under MK Land and Emkay Group. The resorts involved are Langkawi Lagoon Resort, Bukit Merah Lake Town Resort and Taiping Resort in Taiping and Belum Rainforest Resort in Banding Island, Gerik. MK Land and Emkay Group executive chairman Tan Sri Mustapha Kamal Abu Bakar said the MOU showed the beginning of a relationship and collaboration between the corporate body and the army. “We would also like to show our deep appreciation to the army for its contribution to maintaining the peace and safety of the country. The MOU will boost domestic tourism besides benefiting about 120,000 KSSKA members,” he said. SEOUL/LONDON: Asian property investors, including sovereign wealth funds with large war chests, are on a shopping spree for choice office buildings in global capitals, striking while there are bargains to be had. “Given recent price corrections in British and US markets, Savills has seen a sharp increase in interest from North East Asian investors, with many seeing this as a historically unique opportunity to get into these markets at attractive prices,” said Mark Vink, a senior analyst with the property consultant. South Korea’s National Pension Service (NPS), managing US$200bil in assets, wants to invest up to US$3bil in real estate assets this year in London as well as New York, Tokyo and Sydney, said Rockspring Property Investment Managers LLP, which is working on behalf of the pension fund. China Investment Corp (CIC) and Qatar Holding LLC agreed in August to take a stake in Songbird Estates, the majority owner of London’s Canary Wharf Financial hub. In June, AIG agreed to sell two downtown Manhattan buildings, including its headquarters, to a consortium led by South Korea’s Kumho Investment Bank. Lancer Square, an 80,000 sq ft property with offices and retail space in London’s upmarket West End, was bought by a privately-funded Malaysian group, Belworth. The property sold for around £40mil, said Edward Fairweather, a partner at property services firm Knight Frank. Asian buyers want Grade A office buildings in London’s City financial district and the West End, as well as commercial buildings in midtown and downtown Manhattan, industry analysts said. Sung Heundo, head of real estate at Woori Investment & Securities in Singapore, said Asian institutional investors tended to expect annual returns of 8%-10% from overseas property deals, apart from any possible capital gains. ”With property yields in places like Hong Kong and Singapore relatively low, investors have spotted a chance to make double-digit returns and harness good capital growth from UK real estate over the next two years or so,” said Shaun Gorvin, an investment director at BNP Paribas Real Estate in London. DUBAI: Emaar Properties PJSC (Emaar), a Dubai-based global real estate developer has unveiled a special Ramadan package for its homes, with flexible purchase options and benefits offered within the prestigious developments in the 500-acre Downtown Burj Dubai community, says the developer in a recent statement. Listed on the Dubai financial market, the developer of world’s tallest building Burj Dubai, reveals benefits in purchasing the competitively priced properties include up to one-year waivers on maintenance fees for its completed residential units with sales initiative mainly caters for residences in The Old Town, The Old Town Island, Burj Views, South Ridge, and The Residence. “In addition to being part of a fully-established and one of the most popular destinations in Dubai, the homes in Downtown Burj Dubai that are now offered are ready to move in and are set apart by world-class build quality and modern amenities,” he adds. Comes in various floor plans and sizes, The Old Town and Old Town Island celebrate traditional Arabesque architecture in a modern setting with low-rise homes marked by courtyards, while the South Ridge, The Residences and Burj Views are modern high-rises with large terraces, says the developer. Potential customers can also benefit from easy mortgages of up to AED 2.5 million on a wide choice of studios to 3-bedroom apartments in one of the most sought-after lifestyle destinations in Dubai. Besides that, Emaar has announced a special offer for the “Rent To Own” customers who convert to ownership by the end of September. The “Rent To Own” scheme which was unveiled last year, offered customers the opportunity to rent a home for one year and apply their rent to the purchase of their home. With close proximity to Burj Dubai, the world’s tallest building- several unique units which are new to the market are now being offered, all of them with easy access to the various attractions in the city including The Dubai Mall, named the world’s largest shopping and entertainment destination and The Dubai Fountain, dubbed the world’s tallest performing fountain. 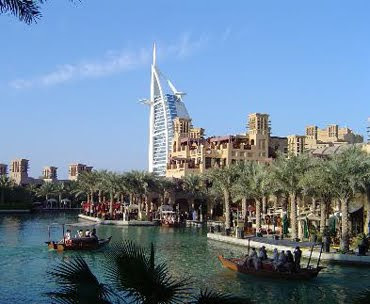 “The Dubai Mall, The Dubai Fountain and Souk Al Bahar are hugely popular among visitors and tourists, while the hotels in Downtown Burj Dubai are popular social hotspots. The diversity of lifestyle choices makes the community a prime choice for homebuyers and the new offer from Emaar will add to the ease of purchase,” says Matrooshi. SINGAPORE: Singapore will release more land for development and make it harder for home buyers to defer payments, steps aimed at curbing speculation in the housing market and that drove down property stocks yesterday. With immediate effect, banks and developers will not be allowed to offer loans on homes under construction where the borrower need only put down as little as a 5 per cent cash downpayment and defer repayment of the principal until after building is completed. The government also said it will reinstate its "confirmed list" of land sales in the first half of 2010 and increase the supply of land available to developers. "Given the current market conditions, the government has decided to adopt several measures to temper the exuberance in the market and pre-empt any speculative bubble from forming," National Development Minister Mah Bow Tan said in Parliament. Singapore's actions come as some Asian governments warn of speculative bubbles in real estate markets and said they may take steps to cool an overheated market Mah's announcement in Parliament caused property stocks to fall sharply. CapitaLand dropped 15 cents to S$3.72 (S$1 = RM2.45), Keppel Land eased 17 cents to S$2.66 and City Developments was down 84 cents to S$10.24. Home prices in Singapore have soared in recent months, with transactions hitting record monthly highs, as buyers flock to showrooms for new apartments. "We are currently seeing signs of heightened speculative activity, although the level of speculation is not yet extreme," Mah said. Song Seng Wun, regional economist at CIMB, described the Singapore government's action as a further sign that authorities are becoming concerned about the rise in home prices, but added the measures themselves appear relatively muted. "It's a tentative step ... more significant would be if the government raises the 5 per cent downpayment," he said. "It looks like the government is going down the softly-softly route first before seeing if it needs to bring out the big stick." SINGAPORE: The selling pressure on property shares could persist in the near term after the Singapore government announced on Monday that certain property measures would be undertaken to ensure a sustainable property market. According to a CIMB-GK Research report on Sept 15, it anticipated values to re-emerge from the measures. Property shares fell by 6%-11% on Monday after the measures were announced. "We retain our positive views on City Developments and Ho Bee with unchanged target prices of S$11.76 (20% premium to realised net asset value or RNAV) and S$1.59 (parity to RNAV) respectively," it said. CIMB-GK Research said CityDev had been very aggressive in the past year in pushing out property launches to very favourable take-up rates. It expected the forward cash flows to remain solid. Impending launches in 2H09 such as the Hong Leong Garden site and The Quayside Isle at Sentosa Cove also targeted the genuine upgrader and niche market respectively. As for Ho Bee, it said the share price performance was tied to a potential re-rating of Sentosa and this segment was largely unaffected by the removal of Interest Absorption Scheme (IAS). The research house also said Keppel Land, with a larger exposure to Singapore offices than residential PROPERTIES , should also be less affected by this news. "We retain our Neutral position on the sector simply because of our negative view on heavily weighted CapLand, as we anticipate some resistance in take-up rates for its up-coming launches such as The Interlace and Farrer Court given the massive scale of these projects," it said. On Monday, Singapore's National Development Minister Mah Bow Tan said certain property measures will be undertaken to ensure a sustainable property market. 3) The abolition of the IAS and interest only housing lans with immediate effect for properties still uncompleted. This measure was applicable only to new uncompleted projects. The IAS will still be allowed for launched developments. However, CIMB-GK Research said the announcement did not come as a surprise, as the government had earlier hinted at its discomfort with rising speculation in the sector. It said the reinstatement of the confirmed list in 1H 2010 and non-extension of the January 2009 budget assistance had been touched on by the government and should be non-events. "The removal of the IAS is the main focus in this set of cooling measures. We believe the move is a pre-emptive strike at the formation of any property bubble given that banks have become more aggressive in offering mortgages of late," it said. CIMB-GK Research while the abolition of the IAS would have a negative impact on demand and sentiment, we believe the impact will not be as severe as that of the removal of the Deferred Payment Scheme (DPS) two years ago. "This is because while there has been some rise in property speculation, the magnitude appears much lower than in 2007," it pointed out. While the IAS was similar to the DPS, there was one fundamental difference. A buyer would need to secure a bank loan at the point of purchase, from a bank chosen by the developer. This means that the credit profile of the buyer will already have been screened by the banks. The buyer who opts to resell his or her property before completion will need to pay a penalty to cancel the loan, typically at 5% of the loan quantum. These factors essentially make it harder for speculators to operate in this cycle compared with 2007 under the DPS. SINGAPORE: United Fiber System Ltd’s (Unifiber) wholly owned subsidiary Sin Poh Lian Sdn Bhd has been awarded building contracts worth RM92.2mil from Niceyear Development Sdn Bhd in Johor Baru, it told Singapore Exchange yesterday. The contracts awarded consist of two development projects at Taman Mount Austin and comprise 268 single-storey terrace houses, 588 double-storey terrace houses and 52 cluster houses. Construction is expected to begin next month and is scheduled to complete by September 2012. “The project is in line with the group’s strategy to expand its presence in the construction industry in the region and is expected to contribute positively to the group,” Unifiber said. The project is not expected to have any material impact on the results for the year ending Dec 31, 2009. A Malaysian company, Universal Pacific Ltd, has been given a 50-year concession by the Laos government to develop a special economic zone near the newly-completed Laos-Thai railway line across the Mekong River. Malaysian and Laos officials in Vientiane said the company was expected to allocate US$50 million (RM175 million) to develop the 53-hectare zone located in Dongphosy at the Laos-Thai Friendship Bridge. According to a Vientiane Times daily, the agreement was signed last Saturday by Vientiane Department of Industry and Commerce director Berlinh Phetchantharath and Universal Pacific chairmanTerence Lai. The company is expected to undertake a mixed development project over a period of 10 years, comprising 3-star hotels, a shopping mall, hospital, bank, public park, duty free market, spa and sports facilities. HONG KONG: Chinese real estate developer Glorious Property hopes to raise over US$1.5 billion (US$1 = RM3.50) in an IPO, joining a rush of companies seeking to list in a rebounding stock market and as home prices increase. An estimated US$15 billion worth of IPOs are coming to Hong Kong in the next few months, with several domestic property groups looking to tap the market rebound. The price range of the Glorious offering is HK$4.00-HK$5.30 (HK$100 = RM45.14) per share, with a base offer size of 2.25 billion shares in total. Syarikat Prasarana Negara Bhd, the state-owned public transport operator, plans to spend up to RM7 billion to extend light rail transit (LRT) lines in Kuala Lumpur. It already has RM4 billion in hand and will call for bids from construction companies next month. Group managing director Datuk Idrose Mohamed said work on the extensions of the Kelana Jaya and Ampang lines, which cover a total of 34.7km, is due to start early next year, after all approvals from the authorities have been obtained. The LRT extension is among a few major deals eagerly awaited by the construction industry, which has not seen large contracts of late. Construction is expected to be completed by the end of 2012. Of the RM4 billion it has, half is internal funds. The balance was raised from an Islamic bond sale recently. "The other RM2 billion (from the bond sale programme) is expected to be raised somewhere in 2010," Idrose told reporters at a briefing in Kuala Lumpur yesterday. Prasarana was set up as part of efforts to revamp the public transport system in Kuala Lumpur and its surrounding areas. Feasibility studies for the LRT extension started in 2006. However, it is unclear why the project took so long to take off. "Of the various alignment options we received during the feasibility studies conducted in 2006 and 2007, we view the proposals submitted to the government last March as the most cost-effective," Idrose said. Idrose said there will be minimal land acquisition for the project as the lines will go mainly through Tenaga Nasional Bhd's cable area, road and river reserves. At least 10 alignment options were received for each LRT line, he added. 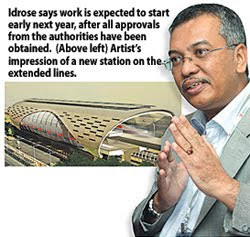 Idrose said the preferred alignments for the Kelana Jaya line extension will begin from the Kelana Jaya station, passing through 13 new stations, including Subang Jaya commuter station and USJ, before ending at Putra Heights, covering a total of 17km. As for the Ampang line, the proposed extension will begin from the Sri Petaling station, passing through Kinrara and Puchong before ending at Putra Heights, covering 17.7km with 13 new stations. A display of the extension can be viewed at the Subang Jaya Municipal Council, Petaling Jaya City Council, Shah Alam Municipal Council and Department of Railways. The public will be given three months to voice their opinions before the plans are finalised.